This past week my granddaughter attended a course at Haliburton School of the Arts, run by Erin Lynch. She had a wonderful time. Erin is very creative and the kids made fantastic projects – including a bird banner – that was something. I forgot to take pictures again!!!! But one project fascinated me. Using styrofoam the kids etched a picture and then printed it. So I thought I would try with my 4-year grandson. I didn’t have any styrofoam but I did have foam sheets. I wondered if they would work – and they did. I made mine first to see if it worked. Then my grandson wanted to make one. On the styrofoam piece etch a picture or design. My grandson did not press very hard so I went over his drawing so it would be deeper into the foam. Put paint into a tin pan or anything that will fit your foam. Use a brush to spread it around. Place the foam upside down in the paint. Press down. Place the stamp that you made on a piece of paper. Press down firmly all over the foam. Lift off carefully – and there is your picture.!!! I asked my grandson what was different between the stamp and his picture. He couldn’t see until I asked him where the head was in each picture. “Oh it is backwards,” he said. We needed to pick up his sister from camp so I forgot to take a picture of his print. Here is the print of mine. I washed off the foam and it could be used again. You could put different paints onto the tray. Here is the foam pad of my Tadeo print. 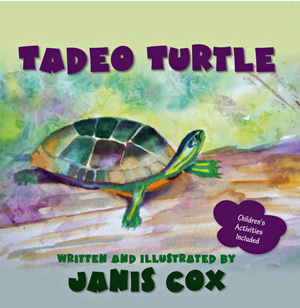 This entry was posted in Creative Saturdays and tagged art, crafting, etching, Janis Cox, paint, painting, printmaking, Tadeo Turtle on August 10, 2013 by JanisCox. What a fun project!! Thank you for sharing at Sharing Saturday! Your print turned out so beautiful! I am now Following your blog in several ways. Have a wonderful week. Great Project!! Thanks for pinning it to bowdabra!!! !